When it comes to scrumptious sweet treats, this mix takes the cake! 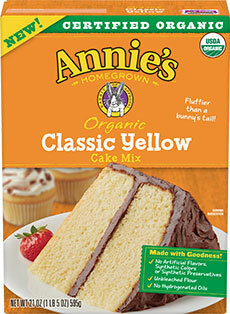 Annie’s Organic Classic Yellow Cake Mix is yummy, fluffy, and perfectly moist. The best part? It has all of the ingredients found in any kitchen pantry already mixed together in just the right amounts – no artificial flavors, synthetic colors, bleached flour and hydrogenated oils. Just add 3/4 cup of your preferred cooking oil, egg replacer, and water to bake up the most delicious Classic Yellow Cake made with organic ingredients! 21 oz. (1 lb. 5 oz. / 595g) package is $6.49.